The beautiful land fort of Nagardhan is located 50 kms from Nagpur and 7 kms from Ramtek. Although Ramtek is frequently visited by tourists they give a miss to this fort. The Archeological Society of India undertook a repair and maintenance project of this fort in 2012. The secret chamber temple in this fort is a special attraction of this fort. The ruler of Ujjain province of Madhya Pradesh handed over the reign of Vidarbha region in Maharashtra to his daughter Prabhavati. The great renowned poet Kalidas was appointed as her aide to manage and administrate this province. That time they had been accommodated in this fort. According to the folklore here it is said that during the first rainfall which was seen from this fort on the Ramtek hills, poet Kalidas had a nostalgic trance of his home territory Ujjain which made him write the well-known poetry Meghdoot. Nagardhan was the capital of Wakatak dynasty. Since then i.e. from 5th to 18th century A.D. this fort was occupied. Apart from the fort there are many historical remains scattered all over the village. As per local folklore this fort was built by King Nandivardhan between 4-5th century and established the town around it. He also built many temples and lakes. This place gained a lot of political importance during the reign of Swamiraj and Watakas (A.D.573). During the time of the Rashtrakuta rule this region became the district headquarters. Later, the King of Gond expanded the construction of the forts on the existing structures. When the Peshwas were ruling the Bhosales of Nagpur refurbished this fort. The main characteristic which attracts one�s attention is the different types and shapes of bastion of this fort in its fortification wall. They are built in octagonal, circle and square shapes. The fortified wall is about 6-8 meters high with narrow windows in it. A small platform of about 3-4 feet wide is built adjoining the wall which can be used to circumvent the fort. The northwards facing fort entrance is about 12 feet high with a chamber of ammunition on it. As we enter the fort we can see a line of porches. There are carvings on the northwards facing door. In the middle and right corner a �Sharabh� has been carved while in the left corner there are carvings of two elephants. Lord Ganesh idol has been carved in the center of the door. Stables for horses can be seen to the left side after we enter the fort and a small door and a stairway to approach the fortified wall. As we take the stairs up, there is shrine on the platform built adjoining the fort wall. The ammunition chamber can be accessed from here. Opposite the stairs there is a temple of Goddess Bhuraidevi. There is a water source here. To access this temple we have to descend through stairways passing through a dark chamber. There is a resting chamber below here for summer time. As its built below the ground level and near the water source it is very cool throughout the year even in the scorching heat of the Vidarbha region. In the south side of the wall there is a chamber with three arches and a secret door below this chamber. Moving ahead from here there is a square shaped pond with steps in it to access the well built inside. It is built in such a way so as to arrest the evaporation of water in extreme summers which the region faces every year. Next to the well is the mansion which has a shallow pond with steps on its four sides. In the ancient times it might have been used as a fountain and a lotus pond. The entrance doorway of the mansion is now devastated. Nagpur to Ramtek is 50 kms and S.T. buses ply regularly. The road to the right from Ramtek village goes to Nagardhan village at 7 kms and can be reached by auto rickshaws. The fort is outside the village. The well inside the fort has water throughout the year. 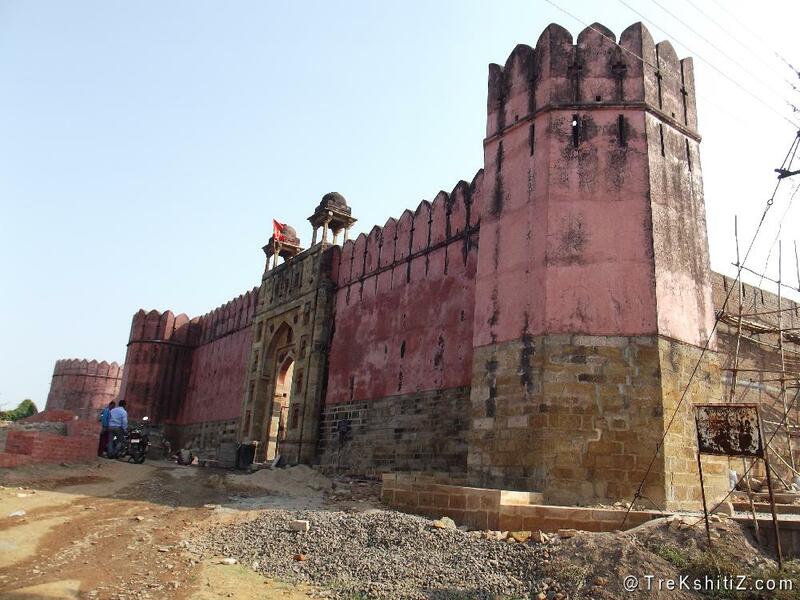 Ramtek and Nagardhan forts can be visited in half a day�s time from Nagpur with one�s own vehicle.